During the production year, livestock are faced with dynamic changes in nutritional and environmental stressors that create nutritional challenges. The last year for many livestock producer have been one of those very challenging years. Many parts of Nebraska experienced high, early spring rainfall and tremendous forage growth, resulting in early maturing and low-quality forages. This created a situation that many cows were thinner than normal years at weaning. We coupled that with high moisture, extreme cold, blizzards, and flooding in last few months. The end result has been really thin cows. Body condition scoring (BCS) is an effective management tool to estimate the energy reserves of a cow. If monitored multiple times across the production year, BCS is a good indicator of direction of body weight change. Body condition score of beef cows at the time of calving has the greatest impact on subsequent rebreeding performance (Table 1). Traditional recommendations suggest cows need to be nutritionally managed at a BCS 5 or greater at breeding for optimal reproductive performance. However, the response is not absolute; some cows are capable of rebreeding at BCS less than 5. Within any year, the normal variation among animals in a herd will result in some cows being below and some above the average BCS of the herd at any given time. This variation may reflect differences in stage and level of production (especially milk), cow size (maintenance energy requirements) and fleshing ability. For instance, in a 7-yr study (Table 2), cows were categorized by their natural variation in body weight change during late gestation as cows that lost -50 lb, maintained BW, or gained 50 lb. Pregnancy rates were increased during late gestation in thinner or cows that maintain body weight compared with cows gaining body weight. Although postpartum body weight change differences were not reported up to and through breeding, this improved reproductive performance may be attributed to a decrease in nutrient requirements in cows thinner at calving and an overall increase in nutrient utilization. Thin cows at calving can compensate and still be reproductively competent if nutrient supply is not limited. Although calving BCS can influence rebreeding and performance of cows, it doesn't mean thin cows will always result in decrease reproductive performance. A large impact on reproduction is direction and magnitude of body weight change after calving and through breeding. Houghton et al. (1990) showed that thin cows gaining condition increased the probability of cows becoming pregnant, however, fleshy (fat) cows losing body condition improved pregnancy rate (Table 3). The effects of poor body condition (less than 4) can be overcome by improved nutrition. The goal is to shorten the period of weight loss by increased nutrient supply so that positive gain can be initiated and the cows can start cycling. Because of the nutritional demands of lactation, it can be difficult to get cows gain body weight economically after calving. This is really due to nutrient requirement are the greatest up to approximately day 60 after calving, which also coincides with the start of breeding. A lactating cow at peak lactation has an energy demand of 15 – 16 lb of TDN per day depending on milk production level. So what do we do if we have thin cows? Additional energy will be required to restore their body condition to a moderate level. The problem with this management scheme is that nutrient demands at this time are high and the additional nutrition supplied may be used to increased milk production rather than body weight gain. For instance, feeding starch-based supplements and being deficient in protein can result in increased milk production. If cows can graze a high-quality forage, the grass will likely meet the energy needs of the cow. However, if pastures are not available, additional supplementation will need to occur with low- to medium- quality hay. In this situation, providing a supplement that is high in protein and energy without limiting forage intake would be ideal. For example, distillers grains (or distillers- based pellets) is an excellent source of protein and energy that would have minimal impact on forage intake. If corn or corn-based supplements are utilized, then protein supplementation would have to be needed to meet protein requirements. Feeding corn on forage intake and digestibility has been shown to be dependent on the level of protein in the diet. In digestion studies, increasing energy in diets containing low levels of protein has decreased intake and digestibility of low-quality roughage; however, with greater levels of supplemental protein, increasing energy typically has little effect on intake or digestibility of low-quality roughage. If possible, sort and manage cows by BCS groups (ie, thin versus fleshy). This will allow you to be more strategic on providing high-quality feedstuff to thin cows, while not over conditioning any fleshy cows. Use reproductive technologies. 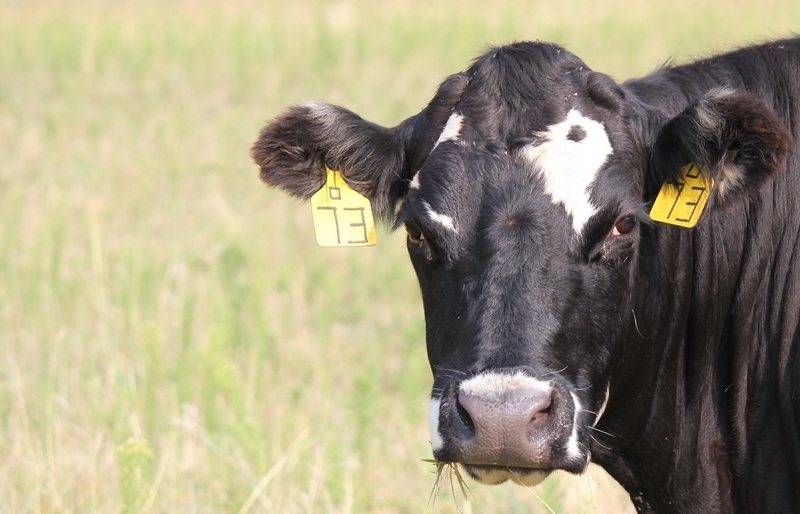 Even if artificial insemination is not utilized, estrus synchronization can help increase the number of thin cows to cycle earlier in the breeding season.